I would never wear this dress. That's not what matters though. Charlize owns this black dress. Love the necklace with this neckline. Kate once again kills it on the red carpet. She pairs a daring dress with the perfect hair, makeup and accessories. And the color is oh so regal. Lupita has been a red carpet favorite all season. It was no surprise when she blew everyone away in blue. This dress is so feminine and flowy. The look is completed by subtle makeup and gold accessories. So, who were your picks for Best Dressed at the Oscars? Jared - for years I never paid attention to you, and I am sorry. You can get it! Charlize - HOLY AMAZING! I love that while it's see thru at the bottom you still see structure from the dress. It's amazing! Kate - knows what she's doing. I always love her in low cut dresses - I'd slay for her chest to do that. My cups are too full for that shizz! Lupita - lovely. Absolutely lovely. I originally wanted a wedding dress this color many moons ago, it's SO pretty. I thought Charlize's dress was strapless at first. I really love it! Did you hear the price tag on her jewels? 15 million in Harry Winston diamonds apparently!! I've been dying to see who you had as Best Dressed! 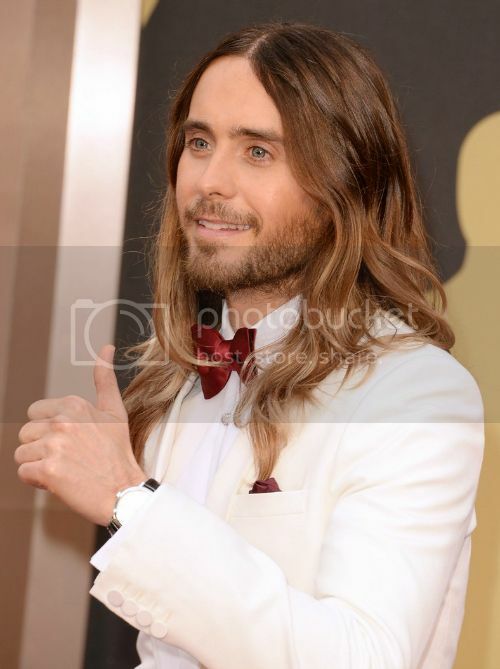 Not usually keen on a man in a white tux, but Jared looked beautiful...his eyes are incredible. So glad he & Matthew won, I loved that movie. Lupita...I really really like the dress & the colour is so pretty BUT for me she has looked even better in the bolder colours that she has worn over the past few weeks. Charlize....I don't like it at all & I'm not mad on Kate's dress either. Nothing original about either of them for me. Can't believe I'm disagreeing with you LOL! Really really enjoyed your coverage & comments, best ever I'd say! You always make me laugh, you have great pics & I love that we're usually in agreement! Well done you!! Lupita was definitely on the top of my list. She looked perfect. I agree Jared is hot, but why does he have to be so odd? I want Jordon Catelanno (spelling?) back!! Love love Lupita's dress on her!! All of these are so amazing! I think Kate was my favorite though.